Special occasions call for special dresses. What to do when you spot such a dress but there’s no special occasion coming up on your social calendar? We suggest spoiling your little miss with a new ‘just because’ dress. Australian-born Megan Park is one talented lady who must be a girly-type girl if her stunning clothing collections are anything to go by. 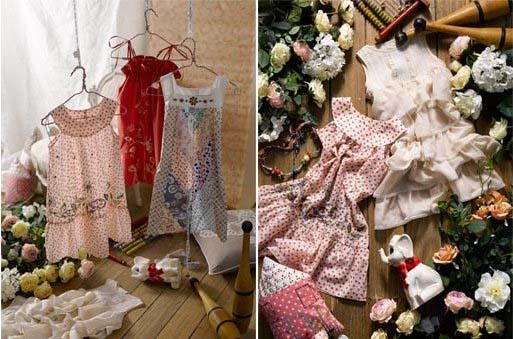 Super sweet for summer, Megan’s girls clothing line is simply named Megan Park Girl and is designed for lucky misses who fall in the two-to-twelve-year-old bracket – Megan released an eight to twelve range recently. Megan Park Girl is filled with beautiful, intricate dresses made from hand-dyed fabrics, with hand block and screen-printing techniques. Even the embroidery is hand sewn, with every bead, every sequin, lovingly placed by hand. All of this careful attention to detail adds to the timeless appeal. I adore the lilac Curly Whirly Tie Neck Dress ($165) and of course will have to add a Bobble and Bow Necklace ($77) to complete the look. I imagine that any little girl will love to wear such a darling ensemble! You can buy your own little piece of the Megan Park Girl collection through Kidostore. Dress prices start at $130 and delivery is available.